Although it's name may sound harmless, bloat is a life-threatening emergency for dogs. The condition, formally called gastric dilation-volvulus (GDV), can quickly kill dogs if they don't receive prompt treatment. Bloat occurs when your pet's stomach fills with air. In many cases, the stomach then twists, cutting off its blood supply. The condition prevents blood from flowing back to the dog's heart and can cause irreversible damage to the spleen, stomach, pancreas, liver, and other organs. Shock can develop soon after the first signs of bloat appear. Breathing problems also occur as the air-filled stomach presses against the diaphragm. Unfortunately, a dog can die of bloat just a few hours after experiencing the first symptoms. Any dog can develop bloat, although it may be more likely to occur in older dogs and males. Great Danes, Saint Bernards, German shepherds, poodles, retrievers and other large breeds with deep, narrow chests are at increased risk of developing bloat. Swallowing air while eating, a problem that can occur in anxious dogs, may also increase the likelihood of bloat, as can eating a large amount during a meal. A genetic link may be responsible for some cases of bloat. Veterinarians at Cummings School of Veterinary Medicine at Tufts University are currently conducting a research study to find the gene responsible for the condition. Although bloat may have a genetic component, environment and diet might increase the likelihood that your dog will actually develop the condition. If a gene is identified, a genetic test could be developed to identify dogs at high risk. What Are the Symptoms of Bloat? Your dog must receive veterinary care immediately if you notice any of these symptoms. Waiting until the morning to visit the vet will result in the death of your dog. Minutes count when your furry friend has bloat. Surgery is used to treat bloat, but it can't be performed until your pet is in stable condition. Before surgery can begin, your pet may receive pain medications, antibiotics and intravenous fluids to treat shock. A tube inserted into esophagus or a large needle placed in the stomach may be used to deflate the stomach and release the trapped air. Bloodwork and other tests may also be performed before surgery. During surgery, your dog's stomach will be repositioned and sutured to the abdominal wall to prevent it from twisting in the future. Surgery also involves thoroughly examining your pet's stomach and organs for signs of damage due to the blood flow blockage. Your pet will stay at the animal hospital for several days following surgery. During that time, the veterinary staff will closely monitor him or her for heart problems, infections, pancreas or liver damage, or other conditions associated with bloat. How can I Reduce My Dog's Risk of Bloat? Change Mealtime. Two to three small meals spaced throughout the day are better than one large meal. Limit Water. Wait until an hour after mealtime to offer water. Lower Food and Water Dishes. Swallowing air is less likely to occur when you place food and water dishes on the floor instead of in elevated feeders. Wait to Play Fetch. Don't start a game of fetch, take your dog for a run or allow him or her to participate in any type of exercise for at least an hour after eating. Don't Give in to Begging. Giving your pet samples of the foods you eat can cause gas to build up in the stomach. Discourage Competition. 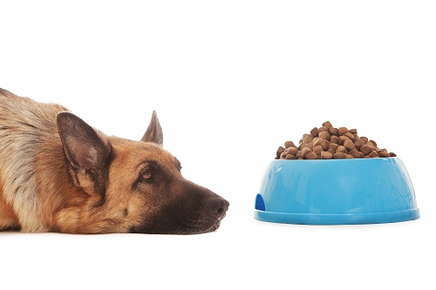 Do your pets wolf down their food in an effort to finish first? The faster they eat, the more likely they are to swallow air. Confining your dogs to different rooms or areas while they eat can help them slow down. Recognizing the symptoms of bloat and taking steps to reduce your dog's risk can help your pet avoid these devastating condition. Call us today if you're worried that your dog may have bloat or if it's time to schedule your furry friend's next veterinary visit.